Why does my CPU only primarily use one core? It loads 100% from one of the CPUs at a time. Is that on purpose? Shouldn't it try to do 25/25/25/25? 4 × 0.25 is the same as 1. It looks like a single-threaded task is scheduled to run on multiple CPUs in a round-robin manner, which is what Windows does to distribute computational and therefore electrical and thermal load between different chip areas to improve heat dissipation. This has nothing to do with multi-threading and is just an artefact of the different scheduling strategies of Windows and Linux. That is possible only if the program allows multi-threading. If the task itself does support muliti-threading, then it cannot be parallelized. For example, Newton-Raphson method. But, your cpu does not primarily use the same core everytime, but chooses one of the cores randomly for the program. For example time, a different core reaches 100% when the program is run every time. Not the answer you're looking for? Browse other questions tagged cpu multi-core scheduler or ask your own question. 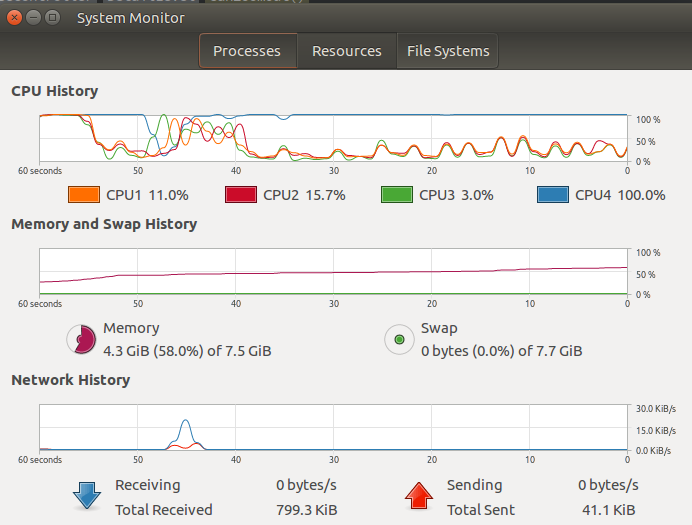 Why is Ubuntu detecting only one processor core? How to run a program with only one CPU core? How to list PIDs (procesees) for one CPU core only?